Any operation that uses a baghouse dust collection system must weigh the advantages and disadvantages of the numerous baghouse filter options available in the market today. The type of filter bag you’ll need to operate at maximum effectiveness and efficiency will depend on the baghouse design, the type of dust involved, and the specific operating conditions of your equipment. Felted filter bags, made from polyester and aramid fibers, are some of the most commonly used cloth filters in modern baghouses today. However, filters can be made from many other types of fibers with many different types of finishes applied to these filters. These finishes were created to address specific needs of different baghouses to improve the dust cake release and/or the collection efficiency of the chosen filter media. The ePTFE membrane is among the most commonly used finishes today because of its ability to improve the cake release of sticky dusts and its unmatched ability to filter extremely small particles from the airstream. Felted filters contain randomly “felted” fibers that are supported by a woven backing material known as a scrim. High energy cleaning techniques, such as pulse-jet cleaning, require the characteristics of strong felted fabrics. Felted bags can be made from an array of commodity and specialized fibers, including polyester, polypropylene, acrylic, fiberglass, Nomex®, Ryton® (polyphenylene sulfide), and P84® polyimide. Each fiber type has its own set of advantages and disadvantages for specific operating environments and offers varying levels of compatibility with a range of chemicals. Polyester felt is the most cost-effective and widely used type of media in pulse-jet style baghouses. Polyester filters offer very good resistance to chemicals, abrasion, and dry heat degradation. For dry heat applications, polyester felt filters offer performance superior to any other synthetics with the exception of Nomex® (Aramid) and Teflon®. However, polyester isn’t a good choice for moist heat applications because it is subject to hydrolytic degradation under certain circumstances. Polyester offers good resistance to most mineral and organic acids, weak alkalis, most oxidizing agents and most organic solvents. Typical applications range from cement plants to electric furnaces. Its normal maximum continuous operating temperature is 275°F. Felted filter bag makers use various surface treatments to improve their dust cake release properties. These include singeing (exposing the surface fibers to an open flame that melts back the loose fiber ends to which dust particles could adhere), glazing (running the felt through two heated rollers to melt back the loose fiber ends and smooth the surface), and adding a water-and oil-repellent finish made of ePTFE (which is cheaper and more durable than an ePTFE membrane), as well as many others. 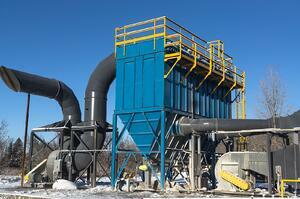 To learn more about the various felted bag options, see Dry Dust Collector Filter Bags. For the most challenging applications, the efficiency and cake release of a filter bag can be greatly enhanced by thermally bonding a thin membrane of ePTFE to the dust side of the filter bag media. Because they offer high filtering efficiency and cake release ability, ePTFE membrane filter bags such as SlyTex (Sly’s ePTFE brand) provide the best available technology in terms of efficiency and filter life. The downside is that the membrane is extremely fragile and care must be taken when handling and installing this type of filter bag. The cost of these types of filter bags has dropped considerably in recent years; as ePTFE membrane bags become more popular, this trend should continue. An ePTFE membrane can be added to most types of fabric filter media. In addition, ePTFE membrane filters have a distinct advantage over non-membrane filters due to differences in the way they filter out particulate. Non-ePTFE membrane filter bags filter particulates using depth filtration, which occurs when a layer of dust cake forms on the outside of the filter, and an accumulation of dust particles is deposited in the depth of the filter. Incoming particles are captured as they work their way through the dust cake and the depth of the filter. As time passes, more and more particles get trapped within the filter, leading to higher pressure drops and eventually filter “blinding,” which reduces filter life. In contrast, ePTFE membrane filters use surface filtration to remove incoming particles. The ePTFE membrane works as the primary filter cake, collecting all of the particulate on the surface because the membrane has extremely small pores, which allow only the air and smallest of particles to pass through. This prevents dust particles from penetrating the filter fabric, which can lead to reduced airflow and filter blinding. The lack of a dust cake on the filter and embedded dust in the depth of the filter also help the dust collector run at a lower differential pressure over time. Pulse cleaning is more through and effective, resulting in a lower cost of operation if an on-demand cleaning system is incorporated. A filter bag made from ePTFE fibers and with a ePTFE membrane (in other words, PTFE on PTFE) gives maximum emissions protection and cake release. When used as the main fiber for a filter bag, ePTFE (Teflon®) offers a normal maximum continuous operating temperature of 500°F. These bags are generally used for severe chemical environments at high temperatures. Common applications include coal-fired power plants, cement production, steel foundries, boilers, carbon black plants, soil remediation systems and incinerators. Furthermore, the low friction properties of ePTFE fibers provide excellent cake discharge. However, PTFE on PTFE is far from inexpensive and is typically used only after all the other options have failed. It’s possible to achieve high efficiency without an ePTFE membrane, which is important because of the fragile nature of the membrane. The latest innovation in felted filter bags is the development of high-efficiency felted filters constructed with ultra-fine “microfibers.” Because fiber surface area and separation efficiency are directly related, these high efficiency felts can provide up to 10 times the efficiency of conventional felts in general filtration applications. Sly’s high-efficiency felt offering, SlyHE, uses a proprietary blend that includes a high percentage of micro-denier (<1.0 denier) fibers, which significantly increases surface area and reduces pore size for greater separation efficiency without added weight. These cost-effective filters require no special installation. SlyHE felts offer a variety of advantages over commodity felts, including higher filtration efficiency, extremely low emissions rates, and longer bag life due to reduced cleaning intervals. Because the performance of SlyHE felts is based on the total felt design, including a micro-denier fiber blend and heavy-duty scrim, they have significant advantages over ePTFE membrane laminated felts that rely on the fragile micro-thin lamination. These advantages include high efficiency without the fragile membrane, higher strength and durability, and the ability to handle oily, fatty, moist or abrasive dusts, as well as alcohol compounds. In contrast, ePTFE does not work well with liquid hydrocarbons (oily or fatty dust). Which bag is right for your baghouse? Dust type: The shape and size of the dust will determine which filter material can best capture the dust particles effectively. Small, angular particles (such as those in cement) have a high abrasive potential. Process dust will contain particles of varying sizes, ranging from those visible to the naked eye to sub-micron particles. One of the key advantages of ePTFE membrane filters is their efficiency in filtering sub-micron particles, which can be crucial to complying with OSHA and EPA regulations. In addition to a discussion of dust type, talk with your filter supplier about the velocity of the airflow transporting the dust and the filter unit and ductwork design in your facility. 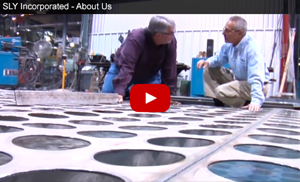 That can help them guide you toward a filter that can offer longer service life. Temperature and humidity: Hygroscopic (moisture-absorbing and –retaining) dusts can quickly become sticky or agglomerative, potentially blinding the filter media. Hydrolysis (chemical breakdown of a compound in reaction to water and heat) can degrade some substrate materials, so it’s important to avoid choosing these materials because they can quickly impact the ability of the filters to maintain efficiency. Gas chemistry: In applications where the process conditions provide a potentially corrosive atmosphere, such as from acids or alkalis, choose the substrate material with care as they have very different characteristics and capabilities. Safety considerations: Some dusts can be corrosive, toxic, or explosive. Selecting an appropriate substrate material, such as a substrate with chemical resistance and anti-static features, can help reduce these risks. Filter cleaning mechanism: It’s important for the vendor to understand how bags are cleaned and the details of the filter unit design to ensure that filters are not subject to undue stress or abrasion, which may affect service life. Filter bag design, in terms of reinforcement and installation, as well as the supporting cage configuration also should be evaluated when choosing the most appropriate substrate material. For help in determining whether a felted or membrane bag will be most cost-effective for your specific filtering application, contact Sly for a free assessment of your operating conditions.